A clothes drying rack is an item that wet clothes are laid upon to dry. Some people will keep the rack in a room rather than leaving clothes on a line outside. If you are living in small quarters and don't have access to a dryer, this is one of the best ways to be able to dry the clothes without them remaining damp for days. 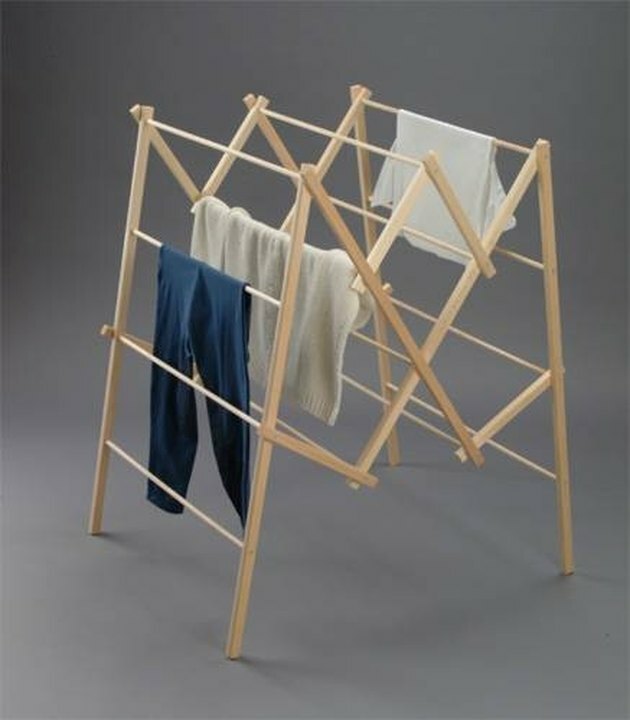 Clothes drying racks can be rather easy to make. You can get creative and add additional levels to the rack if you choose, but for now, here are some basic steps. Cut four pieces of oak 35 inches long. Drill three holes into each piece of wood. One hole will need to be at 16 3/2 inches, then 25 inches and last hole at 33 5/8 inches. Get four pieces of 28 1/2-inch oak plywood. Drill four holes in each one. The first hole will be at 1 1/2 inches, then at 9 7/8 inches, another at 18 7/8 inches and the last one at 27 inches. Cut eight 20-inch long pieces of wood. Drill two holes in each piece. The first hole will be at 1 1/2 inches and the other at 18 5/8 inches. Round off all of the edges of wood. Use sandpaper to sand the plywood and make it smooth. Wipe the wood down with a damp cloth to remove any dust or particles. Put a finish on the wood using linseed oil. Set the pieces to dry. Gather screws to fasten the clothes drying rack together. Begin screwing the pieces together. Begin by making the bottom first and moving towards the top. Nail one 11-inch long piece to each 35-inch piece in the hole at 25 inches. Do the same for the other three long pieces. Screw one 28 1/2-inch piece into one long piece at the end at 33 5/8-inch measurement. Do the same for the other three pieces. Then each long piece of wood will have two pieces of wood connected at this point. Continue screwing parts together. Pick up two of the long pieces of wood and match them together. Point the two pieces attached towards each other and match up the holes. Screw them together. Do the same for the other two long pieces. Then you will have two sides of the clothes drying rack ready. Place one 20-inch piece of wood (with two holes) horizontally connecting the one side to the other. Do the same on the opposite side of the rack. Nail the ends at the 16 1/2 inches on the long pieces. Take the other two 20-inch pieces and nail across the top horizontally. These will be where the clothes will hang to dry. Finish the clothes drying rack. Take four of the remaining 20-inch pieces and screw them across the middle portion of the rack. Laura Hageman has written varied articles on real estate to entertainment topics for the past three years. Hageman wrote a romantic comedy novel entitled Her Desire listed on ebookmall.com. She has written for Web sites such as CurrentForeclosures and Triond over the course of 7 years. Hageman holds a Bachelor's degree in Arts.